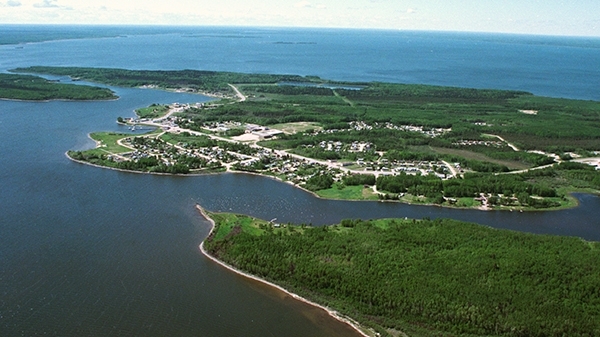 Buffalo Narrows is connected to the rest of the province by Highway 155 and is located just over 500 km from Saskatoon. The nearest larger centre is Meadow Lake, 249 km south. The Buffalo Narrows airport, 2 km southeast, maintains two paved runways to serve the needs of the local mining workforce that works in a week in and a week out rotations. The nearest Cameco facility is our Key Lake operation, 229 km northeast. The majority of the community’s 1,400 residents are aboriginal and many are traditional land users continuing to hunt, fish and trap. The community began as an ancient hunting site that provided a bottleneck to drive the wood buffalo towards. Nestled in the narrows between two lakes and surrounded by forests, this location has offered some of the best hunting and fishing for countless generations. The Buffalo Narrows village was founded in the early 20th century as a trapping, mink ranching and fishing settlement by Scandinavian traders. The village had developed around an earlier Dene settlement during the fur trade. Today, the Twin Lakes Community School is a hub of the community. About 30 teachers and more than 300 students from kindergarten to Grade 12 make the school a central part of their daily lives. Northlands College also maintains a satellite campus in the community. One of Saskatchewan’s most impressive beaches can be found eight kilometers north of the community at Big Buffalo Lake boasting sand dunes and pure white sand that extends 10 kilometers long.